Cranberry plants originate from relatively nutrient-poor environments, but commercial cranberries receive fertilizer to improve plant growth and yield. Increased fertilizer use may influence plant resistance to insect pests. At the P.E. Marucci Blueberry & Cranberry Research Center, a study by Elvira de Lange, Vera Kyryczenko-Roth, Jennifer Johnson-Cicalese, Joan Davenport, Nick Vorsa, and Cesar Rodriguez-Saona looked in detail at the effects of fertilizer on herbivore resistance in greenhouse-grown cranberry plants. Six cranberry varieties were tested: Howes, Early Black, Potter, Stevens, Franklin, and Crimson Queen. The fertilizer regimes were 0, 0.5, 2, and 4g NPK controlled-release fertilizer. We first confirmed that increasing fertilizer rates enhanced nutrient availability in cranberry leaves. Indeed, N concentrations in plants exposed to the highest (4g) fertilizer rate were almost 3 times higher than those in plants without (0g) fertilizer. Also, we confirmed that increasing fertilizer rates enhanced plant growth. 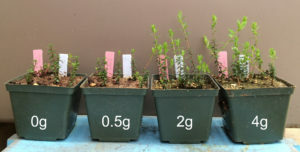 Indeed, upright lengths and weights of plants exposed to the highest fertilizer rate were 5 and 10 times higher, respectively, than those of plants without fertilizer (Figure 1). 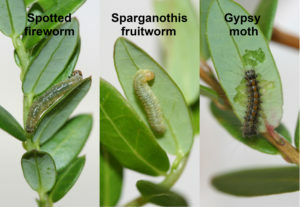 Then, we studied the effects of fertilizer on weight gain and mortality of three important insect herbivores: spotted fireworm, sparganothis fruitworm, and gypsy moth (Figure 2). Cranberry uprights were encased with a small transparent plastic cage, with tops and bottoms made out of foam (Figure 3). One larva was placed per cage, and weighted after 7 or 14 days. 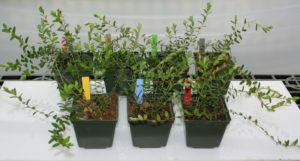 All three herbivores gained more weight on plants subjected to higher fertilizer rates – for all cranberry varieties. Also, the herbivores experienced lower levels of mortality on plants subjected to higher fertilizer rates. This improved insect performance on plants with high nutrient availability may be due to improved quality of the plants as a food source, and/or reduced levels of defensive compounds. To study a possible reduction in levels of defensive compounds, we measured levels of proanthocyanidins (PACs) in cranberry leaves. PACs are involved in defenses against herbivores, as well as microbes. 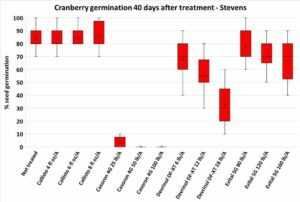 Increased fertilizer rates reduced PAC levels for all cranberry varieties, which may account for the observed increases in larval weight gain. However, gypsy moth larvae gained the most weight when feeding on Franklin, the variety with the highest PAC levels, and gained the least weight when feeding on Potter, the variety with the lowest PAC levels. Thus, at least for gypsy moth, additional defensive compounds are likely involved in cranberry resistance to insect pests. Studying the effects of fertilizer on resistance to herbivorous insects in cranberry may contribute to the development of better practices for integrated pest management, and help to optimize cranberry health and yield. We thank Rob Holdcraft, Kristy Adams, Dan Rice, and Lindsay Wells for assistance with the experiments. Funding was provided by Hatch Project No. 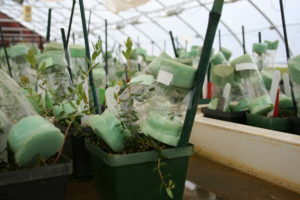 NJ08192 and the New Jersey Blueberry and Cranberry Research Council Inc.
Cranberry plants produce volatiles when attacked by herbivorous insects, which can be used by beneficial insects, such as predators and parasitoids, to find food or hosts. Synthetic volatiles could potentially attract additional beneficial insects to cranberry fields, reducing insect damage and resulting in reduced yield losses. These volatiles could be used also to monitor the abundance of beneficial insects in agro-ecosystems. At the P.E. Marucci Blueberry & Cranberry Research Center, a study by Drs. Elvira de Lange, Jordano Salamanca, James Polashock, and Cesar Rodriguez-Saona looked in detail at the emission of volatiles in different cranberry varieties (Figure 1), as well as the effects of synthetic volatiles on attraction of natural enemies of herbivores. 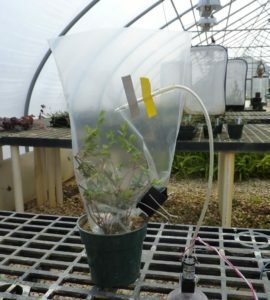 To study plant volatile emissions, we placed greenhouse-grown cranberry plants in bags, and sucked air out of the bags with small pumps (Figure 2). The air passed through a trapping filter with an adsorbent material, trapping the volatiles. Analysis revealed that volatile emissions in response to herbivory differed among cranberry genotypes. At the molecular level, we studied the expression of genes that are involved in the biosynthesis of these volatiles. We harvested leaf material, and found that the expression of two genes associated with volatile biosynthesis did not differ among the cranberry genotypes. These results indicate that other, not yet identified, genes may play a role in regulating volatile emissions in cranberry plants. (Z)-3-hexenyl acetate repelled ladybeetles. Thus, the responses of natural enemies to synthetic volatiles in cranberry beds varied from repellency to attraction. Experimentally changing plant volatile emissions may have some positive effects on biological control by attracting natural enemies, but can also have some serious negative consequences. Not only beneficial insects could be attracted, but herbivorous insects could be attracted as well. Also, certain natural enemies could be repelled. There is a possibility that when volatiles are present, but prey or hosts are absent, natural enemies learn to stop responding to the presence of volatiles. 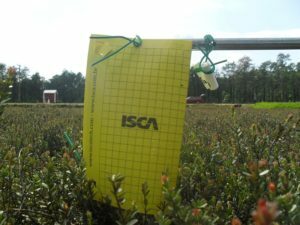 Our results indicate that, when practiced with care, synthetic volatiles may contribute to sustainable pest management practices in cranberry through the monitoring and recruitment of desirable natural enemies. This study is published in the Journal of Chemical Ecology: https://doi.org/10.1007/s10886-018-1043-0. We thank technicians Vera Kyryczenko-Roth, Rob Holdcraft, and Kristy Adams, as well as the summer students in 2014 and 2015, for assistance with the experiments. Funding was provided by Hatch Project No. NJ08192 and the New Jersey Blueberry and Cranberry Research Council Inc., Cranberry Institute, Cape Cod Cranberry Growers Association, Canadian Cranberry Growers Coalition, and Ocean Spray Cranberries, Inc.